What do you do when you get an idea for a trip? Do you write it down? Tell a friend? Start planning on your lunch break? For me, it varies. Sometimes I let it linger in the back of my mind, not sure I’ll have the energy. Or the courage. Sometimes I start digging in right away–researching locations, checking flights, inviting friends. 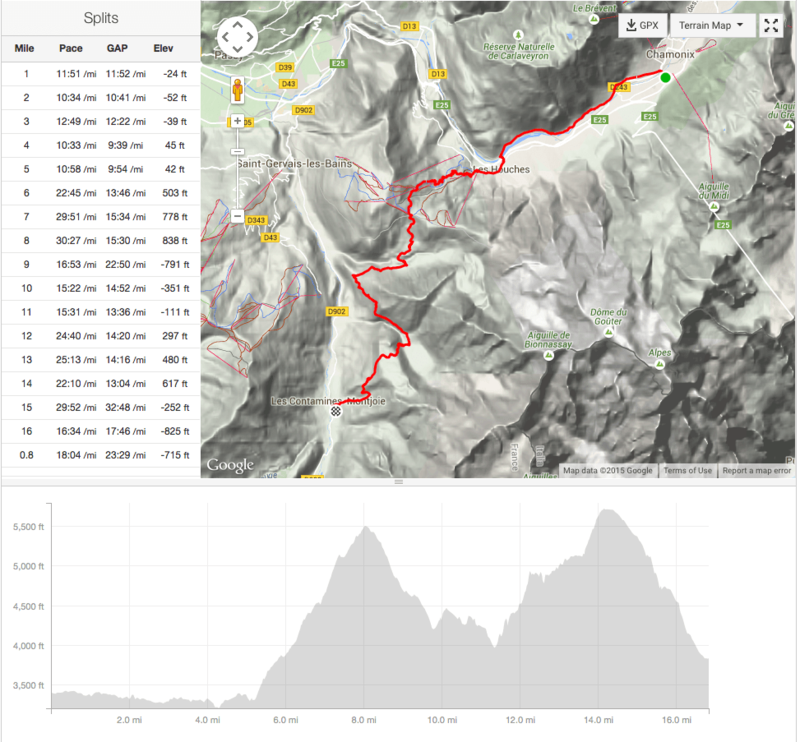 And that’s what happened with the Tour du Mont Blanc. It’s a testament to how awesome your friends are when you ask them to go to Europe to run 105 miles and they say, “Sure!” pretty much immediately. Kaylee Barton, Brian Barton, Ed Carter, Lori Cowin, and Joe Cowin, you are all ROCK STARS. Thank you so much for saying yes. Our first need was an outfitter. I looked at many companies and corresponded with two. I ended up choosing Run the Wild UK because I liked the personal correspondence and enthusiastic attitude of owner Simon James. They advertised a five day route, and I’m so glad our friend Joe suggested we try for six. Simon was really wonderful and accommodating through the entire planning process. He was very patient and British and kind. I really recommend his company for your next running adventure. One perk they don’t advertise online is the canine support. Their two dogs Bailey and Lottie provided essential snuggle therapy at all the right moments. Simon hired Emily Andrew as our Lead Runner and we could not be happier that he did. I was already excited when I read her bio since she teaches English (my field) and Geography (John’s field). I thought, well we’ll have something to talk about. I wasn’t wrong, but beyond that, I enjoyed every minute I spent with Emily, who we came to call “Lady Emily,” because, well, we loved her. Emily was so sensitive to every runner’s needs. She knew the route with nearly photographic detail. She supported us through steep climbs, melt-downs, and long days. And she was so fun to hang out with! 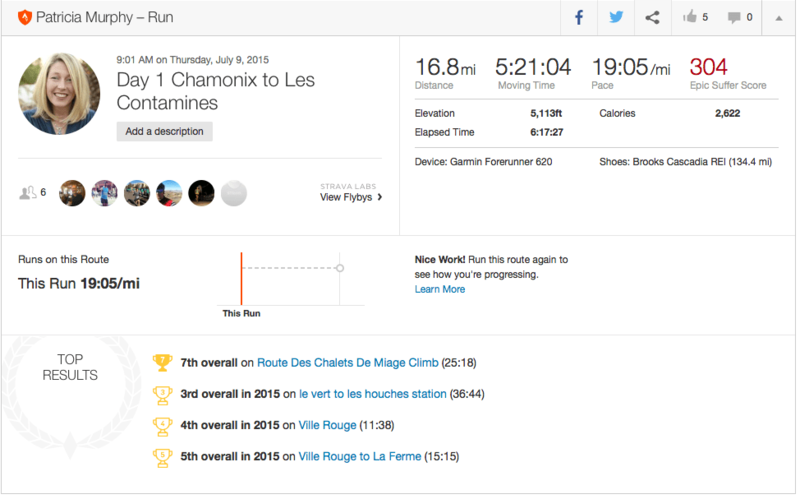 Since most people do the Tour du Mont Blanc in 11 days, our thoughtful and wise Lady Emily planned our route with five “double days” (that had two big climbs each) plus one easier day that only covered a normal stretch of the trail. This turned out to be a great way to run and hike the route. Our Day One therefore had two big ups. We started in Chamonix, an absolutely lovely French Alpine town. We ran through an urban path until our first big climb, where we met some mountain bikers who turned out to be World Cup riders. We had lunch with Simon and his girlfriend Karin and the pups, then headed out to finish the run, whose highlights were a stop at Les Chalets du Miage, rambling with cows and cowbells, and endless gorgeous views. Here is an interactive map, though it’s in meters (we got a crash course in the metric system). Here are the full stats for Day One: 17 miles, 5113 ft elevation gain. That was harder than my hardest day of training. But what more could I have done? Sadly, I don’t have the Alps in my backyard. Overall I felt strong on Day One. Not sore. Tired. I felt I could have used a bit more down time. But overall, I finished the day excited for the next. Our view from the hotel Day One. Team TMB all ready to run. Running through Chamonix on our way to Les Houches. We’ve just done one of the first big climbs. 2000 feet in about 3 miles. Ever get tired of this view? Team TMB having a short rest. The view back down into Chamonix. I need this writer’s shack! John enjoying a frosty beverage at Les Chalets du Miage. We had perfect weather the whole trip. Rolling into our stop for the night, Les Contamines. Team TMB did a great job on Day One! Relaxing at our first stop, Hotel Gai Soleil. Our first dinner of the trip! It was beautiful and delicious! This desert was our first introduction to “ground cherries.” Turns out I’m a fan!